Except for the info released through the label, not a lot is known about this Amsterdam based Neo-Psych band. Failing info sources, I don't even know who's in the band except for Hugo van de Poel, whom writes all his songs in the comfort of his home, records the songs (playing all instruments himself) with his best-friend-since-basic-school, Jacco Gardner, and then plays 'em live on stage with his band (of which I have found no info what-so-ever!). Not exactly an unknown entity for Sixties connoisseurs, this Jacco Gardner, whom with his band The Skywalkers delivered the already classic Freakbeat album Year One. Actually, he and van de Poel have been in bands together since the latter was 12 (even played in The Skywalkers for a while), and all that time they wrote songs together. 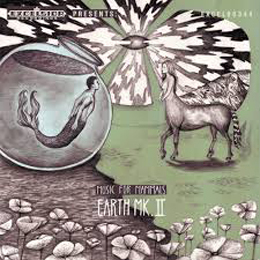 It was the original intend of the twosome to also help out in each other's solo projects, but van de Poel finds the method used for his own Earth Mk. II a lot more rewarding, as it is an answer to all the aspirations he ever had about music making. Following the recordings of two demos, Excelsior Recordings offered van de Poel an opportunity to release a full-length debut album, an occasion for which the latter again returned to Jacco's home studio, whom again produced the album. According to the info sheet, “the melodic '60s Psych influences which were clearly present with The Skywalkers are also the basis for what Earth Mk. II does. Think about the likes of The Zombies, Billy Nicholls and Syd Barrett. But van de Poel also took inspiration of later bands of a same musical spirit from the '80 to current day, bands such as Nirvana and The Vaselines, but also the lo-fi production of White Fence. On Music For Mammals this results in lo-fi melodic Pop songs with both acoustic and Fuzz guitars...”! Sounds good on paper, doesn't it? Well, it also sounds good in audio, as you will be able to ascertain yourself, by listening to the songs “Forever Yesterday” and “Here I Am” (which incidentally constitutes the album's first single, released on July 4 of last on a limited edition numbered vinyl to coincide with a show at Amsterdam's OT301 venue), videos of which are posted at both the band's page on the label's website (www.) excelsior-recordings.com and the band's own (www.) earthmark2.com (which re-directs to the band's page at tumblr). These two songs do not quite give a complete picture of the album as not àll performances on the album can be credited to van de Poel alone. For instance, “Memories” is actually a duet with a female singer...or rather, an acoustic guitar (backed with a faint organ keyboard line toward the end of the track, being the only instruments used) ballad on which a female singer (of which we can assume it is of one of the two women in his live band) has a dominant role, with van de Poel bringing backing vocals. Also, on some of the other tracks this very same female singer brings some background vocals (mostly though, van de Poel does his own backing harmonies). Wacky vocals, by the way...in true '60s Psych spirit! Definitely one of the nicer surprises of the 2013 releases so far, and although I won't go as far as nominating Music For Mammals for my 2013 year-lists, there's a good possibility (Concrete Web's work schedule allowing) that I'll grab back to the album somewhere later this Summer...you know, relaxing on the eve of a hot day on the porch, with a cool lemonade in hand, with this kind of music in the background...a perfect ending of a such day, I should think! Crap...the album may well be upgraded to be part of those “Best Album Of 2013”-lists yet!